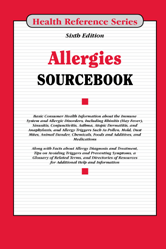 Allergies Sourcebook, Sixth Edition provides updated information about the causes, triggers, treatments, and prevalence of common allergic disorders, including rhinitis, sinusitis, conjunctivitis, allergic asthma, dermatitis, eczema, hives, and anaphylaxis. It discusses the immune system and its role in the development of allergic disorders and describes such commonly encountered allergens as pollen, mold, dust mites, and animal dander. Chapter 14 — Food Allergy or Food Intolerance: How Do You Tell the Difference? Section 19.1 — What Is Wheat Allergy? Section 35.2 — Is It Really a Penicillin Allergy? Chapter 37 — Cold, Flu, or Allergy? Section 43.4 — What about Carpets? Section 43.6 — Do You Suspect Your Office Has an Indoor Air Problem?